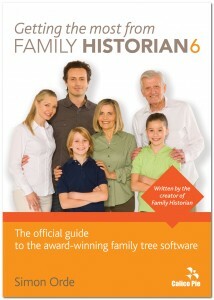 Last week Calico Pie announced the new "Getting The Most From Family Historian 6" has been released as a printed book. For more information see New guide to Family Historian: Getting the most from Family Historian 6 for more information and to download some sample pages. Please note: The book has proved very popular and has been going in and out of Stock at Amazon. If it's out a 3rd party seller is selling it at . . . wait for it £71.99! Don't buy it at that price, just wait a few days and the Calico stock should appear. 3rd party seller pricing seems to be random, it has now reached £131.96 for this item and an eye-watering £248.20 for Version 5. Currently in stock at £14.95. I'm appalled by this! I asked at the WDYTYA show last year about this book, that's how long I've been after it for. I checked on March 12th but it wasn't available, now it IS available it isn't?! WTF! And for £131?! Seriously!! I'm recovering from major surgery and this would be a perfect time for me to get this, and finally learn how to make the most of the programme, but I'm being expected to believe that its sold out already? Firstly it wasn't available on March 1st as claimed. Now we are in April and its suddenly sold out? Ebonyuk72 wrote: I'm appalled by this! I asked at the WDYTYA show last year about this book, that's how long I've been after it for. I checked on March 12th but it wasn't available, now it IS available it isn't?! WTF! And for £131?! Seriously!! As I explained in an early post, Calico have been shipping stock to Amazon and the book has been in and out of stock a few times in April. The "stupid" price is not under Calico's control. When I looked this morning the book was in stock. Just to confirm the above... I ordered a copy from Amazon on 27 April. Arrived on 30 April even though I asked for 'Standard' (Slow!) delivery. Price? £14.95 with 'free' post and packing, as I added another item from my wish list to bring the total up to the minimum for 'free' delivery. Bi the bi, there is an implied warning on the Calico Pie website suggesting 'it will say "Calico Pie" if it is indeed supplied by us. Another sad example of Rip-Off Britain but not Calico Pie's fault. Personally, I consider Amazon's 'passive' attitude to this pricing behaviour questionable. Amazon was out of stock when I looked a little while ago but managed to obtain it from S&N Genealogical Supplies ( https://genealogysupplies.com/) for c. £17. It arrived the following day. Irene, give William Clegg's book a miss. Nobody at FHUG knows who he is, and his books have been around for years, but contain advice contrary to what we suggest here. Will a digital (PDF or Kindle) version of this book be for sale at some point? Kathy, remember that we are the FHUG and not privy to Calico Pie plans. So you need to ask them that question via the FH support page. I just saw this book on Amazon - I see there was a flurry of interest here when it came out, I wondered if, now time has passed, people would recommend it to someone with some experience of FH but still only scraping the surface, or is FHUG enough for me to learn from? Appears to be very comprehensive, but written in a style that personally induces 'brain fog'! See my other posts on loosing the way with using FH! However, if you can cope with, or have, a brain wired for these things, it is very handy to have the written page, rather than flicking between endless screens and becoming totally discombobulated! I don't use my copy much, but I'm no going to sell it, if you understand? Tony, it is difficult to advise without knowing what you want to learn about. Why not try the free V5 copy of the Book as suggested in Knowledge Base > Key Features for Newcomers because the V6 copy only seems to add two chapters. See the "Getting the Most From Family Historian" Comparison for other differences. That's a good call on the v5 edition - I've only ever used the most obvious data entry features, am only now looking at queries and plugins, and have no (immediate) need to make a website or a book from my tree. These things may change of course!